Prime Minister Trudeau has on a number of occasions expressed his personal opposition to BDS, in addition to clearly stating that BDS is contrary to Canadian government policy. PM Trudeau and the Liberal Party supported the 2016 Conservative motion formally denouncing BDS and calling on the Canadian government to “condemn any and all attempts by Canadian organizations, groups or individuals to promote the BDS movement, both here at home and abroad” (emphasis added). In a 2015 interview, PM Trudeau stated that “I’m opposed to the BDS movement. I think that it’s an example of the new form of anti-Semitism in the world, as Irwin Cotler points out, an example of the three ‘Ds’: demonization of Israel, delegitimization of Israel, and double standard applied toward Israel” (emphasis added). Speaking at the University of British Columbia in 2015, he furthered that “the BDS movement, like Israel apartheid week, has no place on Canadian campuses.” He reiterated this point on Twitter regarding BDS at McGill, where he included the hashtag “EnoughIsEnough.” During his St. Louis apology speech, PM Trudeau added that “Jewish students still feel unwelcomed and uncomfortable on some of our college and university campuses because of BDS related intimidations. And out of our entire community of nations it is Israel whose right to exist is most widely and wrongly questioned” (emphasis added). On January 15, 2019, speaking at Brock University, Trudeau stated that “You have movements like BDS that singles out Israel, that seeks to delegitimize and in some cases demonize. When you have students on campus dealing with things like Israel apartheid week that makes them fearful of attending campus events because of their religion in Canada. We have to recognize that there are things that are not acceptable not because of foreign policy concerns but because of Canadian values. It is not right to discriminate or make someone feel unsafe on campus because of their religion and unfortunately the BDS movement is often linked to those kinds of frames. So yes I will continue to condemn the BDS movement” (emphasis added). “Our presence in this land, as Christian and Muslim Palestinians, is not accidental but rather deeply rooted in the history and geography of this land, resonant with the connectedness of any other people to the land it lives in. It was an injustice when we were driven out. The West sought to make amends for what Jews had endured in the countries of Europe, but it made amends on our account and in our land. They tried to correct an injustice and the result was a new injustice” (2.3.2). “Some (Palestinian) political parties followed the way of armed resistance. Israel used this as a pretext to accuse the Palestinians of being terrorists and was able to distort the real nature of the conflict, presenting it as an Israeli war against terror, rather than an Israeli occupation faced by Palestinian legal resistance aiming at ending it” (1.5). “Palestinian civil organizations, as well as international organizations, NGOs and certain religious institutions call on individuals, companies and states to engage in divestment and in an economic and commercial boycott of everything produced by the occupation. We understand this to integrate the logic of peaceful resistance. These advocacy campaigns must be carried out with courage, openly sincerely proclaiming that their object is not revenge but rather to put an end to the existing evil, liberating both the perpetrators and the victims of injustice” (4.2.6). KAIROS Canada published a document in 2012 that details numerous “economic advocacy measures” (including various forms of divestment) that KAIROS members can take. KAIROS Canada also states that “Global Affairs Canada’s recent announcement of $4.5 million over five years to five of KAIROS’ grassroots partners in the Global South, including Wi’am Palestinian Conflict Transformation Center, signals the importance of women-led peace building.” Again, Wi’am’s support of BDS – including anti-normalization between Israelis and Palestinians – makes any such “peacebuilding” efforts between Israelis and Palestinians impossible. Wi’am is a signatory to the “Call for Worldwide Women’s Endorsement of BDS” (2016) calling upon “women and feminists of the world, as well as women’s organizations and collectives, to endorse the BDS Call issued by Palestinian civil society in 2005 and join to the BDS movement to support our struggle for freedom, justice and equality” (emphasis added). 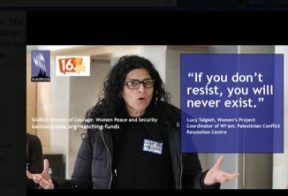 Lucy Talgieh, Women Coordinator at Wi’am, was a signatory on a call of Palestinian Feminists in Palestine and Diaspora declaring support in “stand[ing] with the struggle of the indigenous/native Palestinians against the colonial apparatuses used by the Israeli occupation regime” (2016). According to the call, “our duty is to engage in this struggle, in accordance with our respective circumstances, and to encourage international solidarity movements, the most effective of which is the Boycott, Divestment and Sanctions (BDS) movement” (emphasis added). The call furthered an anti-normalization agenda, stating that “We deplore the colonial attitude inherent in some Israeli feminists’ request of us to sign a statement in favor of liberal ideals, ‘dialogue’ and ‘co-existence’ and against the effective solidary with the struggle for rights. The main problem here lies in the assumption that Palestinian and Israeli women stand on equal footing and can coexist despite the ongoing regime of occupation, colonization and apartheid” (emphasis added). In November-December 2018, Talgieh and Wi’am’s project manager Tareq Al Zoughbi participated in KAIROS Canada’s “Women of Courage: Women, Peace, and Security” events in Ottawa and Toronto. Wi’am’s project manager Tareq Al Zoughbi presents at “Karios South/South Gathering 2018/Canada.” See here for issues regarding these maps. Talgieh is one of the authors of the Kairos Palestine document (see above for details regarding the antisemitic and discriminatory nature of this document). On November 15, 2018, the BDS group Amos Trust interviewed Talgieh. In the interview, Talgieh expresses her support for the antisemitic Kairos Palestine document, stating that “It is why statements like the Kairos Palestine call are so important, as they call on the whole Christian world to help us to change our situation. It was such a privilege to be recommended to be the youngest author of Kairos Palestine and one of only a few women” (emphasis added). She also expressed her support for BDS campaigns, stating that “We call on them [international community] to join us in our resistance to the evil of occupation and pressure on Israel. We ask the international community to do its duty. We call upon it to exert pressure on Israel by all effective means and by imposing sanctions to intervene for peace and justice, and to lift the injustice of the people of Gaza and the entire Palestinian people. We call on it to treat Israel as an apartheid state until it submits to international legitimacy” (emphasis added). On May 18, 2018, Talgieh posted Kairos Palestine’s letter “calling for justice on the 70th anniversary of the Nakba.” The letter states that May 15 marks “70 years since Nakba, or catastrophe, the ethnic cleansing that led to the establishment of Israel” and that “Palestinians know for certain that Israel’s case is morally untenable and Israel, itself, will collapse under the weight of its own immoral political ways.” The letter Talgieh posted also calls for BDS in the form of ending “economic, cultural, academic and military” with Israel. On February 19, 2013, Talgieh posted a video “Boycott Apartheid” on Facebook. The video calls on individuals to “boycott apartheid, boycott Israel,” and provides a link to the BDS Movement website. On December 29, 2011, Talgieh posted “CODE PINK they are doing such a great Job, People I encourage you to watch it” and shared a BDS video about boycotting SodaStream and Ahava. On its website, Wi’am’s director Zoughbi Zoughbi states that “Let’s put the world in front of its political responsibility once more. They have held on to the guilt they had for the Jewish people, which resulted in the UN resolution of 1947 that created Israel, but what makes us a lesser nation? We are the victims of the victims of the holocaust, and thus its direct victims and we too need our home, our safe haven…” (emphasis added). Wiam also stated that “The Palestinian people are dying on the Cross…Palestinians are taken from the Cross-to hide the Israeli Crimes. In an attempt to silence our voice, the Israeli occupation imposes sanction and siege on our people…We are laid in the Tomb” (emphasis added). On February 5, 2019, Talgieh posted a letter that refers to the “daily Holocaust of his people in the occupied Palestinian Territory, and his city of occupied Jerusalem.” The letter also refers to the Western Wall as the Al Buraq Wall. UCC is one of the main proponents of BDS campaigns in Canada. The group leads the “Unsettling Goods” campaign, a BDS campaign targeting businesses and companies that allegedly do business in Israeli settlements. Encouraging all courts, bodies and members of The United Church of Canada to apply such divestment strategies and sanctions, until such time as the occupation of the Palestinian territories ends” (emphasis added). UCC endorsed Apartheid Week campaigns on Canadian campuses in 2012 and 2010. In September 2017, Jan McIntyre, an EAPPI participant, wrote in an October 2015 blog post that “The 48 year Israeli occupation (illegal according to International Humanitarian Law) of Palestine, with even greater repression of human rights over the last several months, has led some young Palestinians to respond violently. Frustrated and desperate, and prohibited from carrying guns, they have resorted to the use of knives as a tool to stab Israeli soldiers and citizens” (emphasis added). During a September 2017 presentation on EAPPI given by Gordon Timbers of the Presbyterian Church of Canada, an audience member asked, “Excuse me; I have to make a comment at this point. I don’t know how many people here have seen the model of the gas chambers … and some of these things really remind me [unintelligible] and I often wondered if any Jewish people who go in to see that model ever think of what is set up here” (emphasis added). In his answer, Timbers did not dispute the false claim answering instead “…Thank you for that, because there are similarities. All these identity papers and restriction of movement and checkpoints and all of these things, yes, that does make people think” (emphasis added). The BDS Movement website features a 2011 statement by Rev. Brian McIntosh, the spokesperson for the Holy Land Awareness and Action Task Group, of the Social Justice and World Affairs Committee within South West Presbytery of the United Church of Canada. The statement explains that the group “launched Occupied with Peace in Palestine, a Boycott/Divestment Campaign” to encourage “individuals and organizations, particularly congregations of the United Church in its region, to use economic leverage to persuade six companies operating in Canada – Caterpillar, Motorola, Ahava, Veolia, Elbit Systems and Chapters/Indigo – currently involved in illegal activities in the Palestinian Occupied Territories – to stop supporting the Israeli occupation and uphold international law” (emphasis added). Member of the ACT Alliance, a coalition of 144 churches and church-related organizations. ACT Alliance promotes BDS. On November 26, 2016, UCC took part in sponsoring “Gaza Calls: Canada Answers,” featuring Raji Sourani. Raji Sourani, founder and director of the PCHR, served “a three-year sentence [1979-1982] imposed by an Israeli court which convicted him of membership in the illegal Popular Front for the Liberation of Palestine…” He was also denied a US entry visa in 2012. 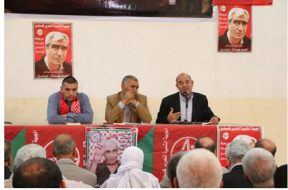 Sourani was imprisoned an additional three times “in 1985 and 1986…” In February 2014, the PFLP organized a ceremony in Gaza honoring Sourani for winning the “Alternative Noble Prize.” Rabah Muhana, a member of the PFLP Political Bureau, delivered a speech at the prize ceremony. In December 2009, KAIROS Canada responded to the Canadian government’s accusations that it led “the campaign of boycott, divestment and sanctions campaign against Israel,” stating “KAIROS agreed that divestment from a Canadian corporation invested in Israel, the West Bank or Gaza that is ‘contributing directly or indirectly to violence, occupation or other human rights abuses in the region’ is an action that its Member churches and organizations may choose” (emphasis added). In January 2008, KAIROS Canada published a “strategy paper” entitled “Economic Advocacy Measures: Options for KAIROS Members for the Promotion of Peace in Palestine and Israel.” This document promotes divestment from Israel, “on grounds that the company is complicit in violations of human rights and international law” and promotes the campaign led by the US Presbyterian Church, headed by the radical Palestinian NGO Sabeel. The text also describes KAIROS Canada’s plans to coordinate these activities among its member churches. 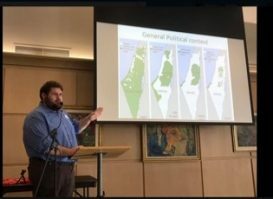 On May 12, 2018, KAIROS Canada’s Victoria branch hosted an event “Just Peace in Palestine-Israel,” featuring a speaker from the anti-Israel BDS group Independent Jewish Voices (see above). The event also featured the “added attraction” of “The Promised Land Museum Travelling Exhibit,” which attempts to draw equivalence between Nazis during the Holocaust and Israeli treatment of Palestinians. Ateek serves as the director of Sabeel, an “ecumenical grassroots liberation theology movement among Palestinian Christians.” Sabeel argues that Palestinians represent a modern-day version of Jesus’ suffering and utilizes “liberation theology,” supercessionist rhetoric, and the concept of deicide to demonize Israel. Given the three organizations’ clear involvement in discriminatory BDS campaigns against Israel, the 2018 grant to Wi’am, UCC, and KAIROS Canada is inconsistent with Canadian values and positions articulated by Prime Minister Trudeau, the Liberal Government, and the Official Opposition. The information in this document suggests that immediate action should be taken to address concerns about NGOs selected for this grant, and that a formal review of the approval processes for bilateral aid to NGOs take place. The Unsettling Goods Twitter account also regularly retweets BDS organizations, including CJPME, Jewish Voice for Peace, DCI-P, Sabeel, and the World Council of Churches (WCC). Dr. Zoughbi Zoughbi, W’iam’s founder and director (see above), has been the EAPPI Secretary and the Local Programme Coordinator since June 2017. See NGO Monitor’s report “EAPPI: The World Council of Churches’ Training Camp for Anti-Israel Advocacy” for details. In 2015, Global Affairs Canada provided UNICEF with $10 million, of which $1 million was allocated by UNICEF to the West Bank and Gaza for “Emergency Assistance – Education in Emergencies and Child Protection.” The activities that Canada claimed it funded differ significantly from the description provided by UNICEF. Canada stated that it provided funds to UNICEF for training teachers, counselling support, and reinforcing schools, among others. UNICEF however states it used the money to train EAPPI volunteers; record cases of intimidation, harassment, and excessive violence that allegedly impeded school attendance; and for “advocacy work.” See here for more details. The PFLP is listed as a “terrorist entity” by the Government of Canada. In June 2018, Citibank and Arab Bank PLC withdrew their services from DCI-P, due to concerns over the NGO’s links to the PFLP.